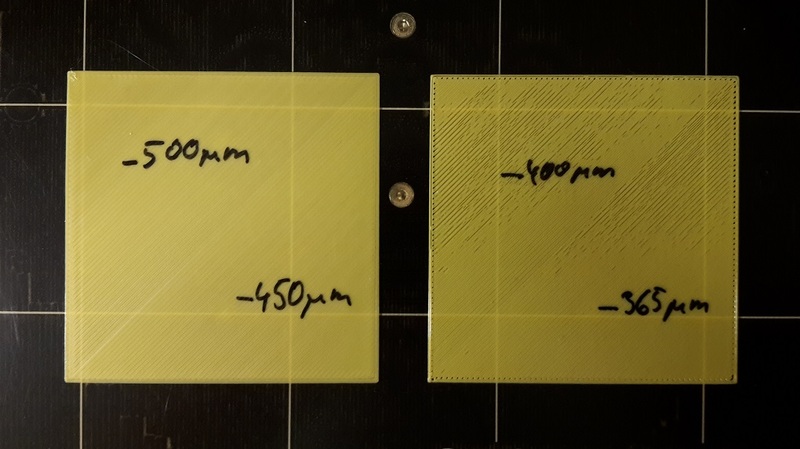 XYZ calibrated but X/Y are skewed. 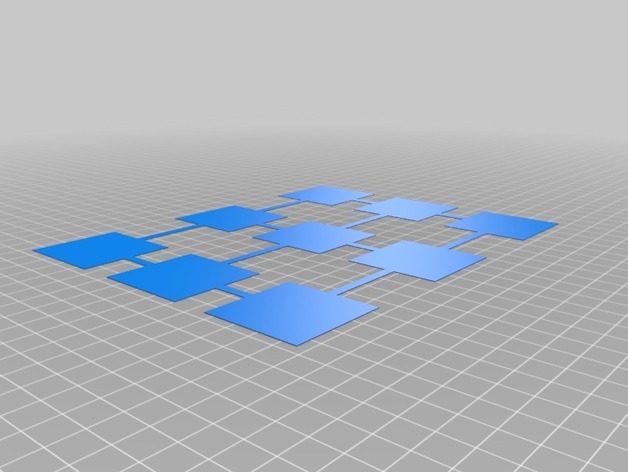 Thingiverse Files to Print, Last checked on 2016-12-30. My current collection is located at: http://www.thingiverse.com/whitedragond/collections/prusa-i3-mk2. If you've seen my channel then you'd know that this P.I.N.D height calibration tool will be invaluable to fine tune the height of the P.I.N.D. sensor relative to the height. 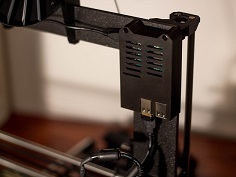 This is the new file, from the forums, to calibrate your LIVE Z adjustment. This file covers the whole bed of the Prusa I3 MK2 with a grid of 9 40mm squares 0.2mm thick which can be used to check and tweak bed level adjustments. 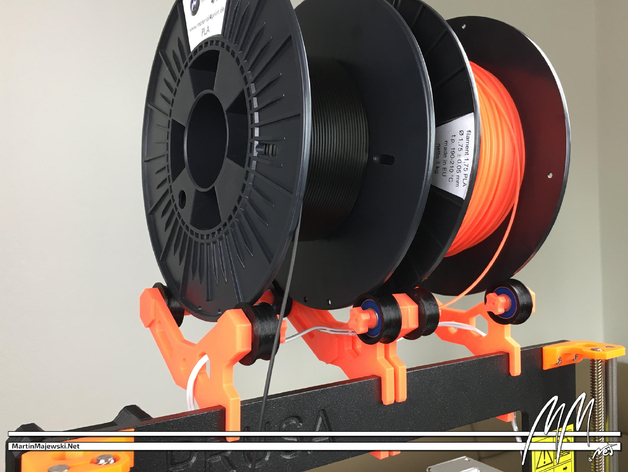 The Prusa i3 MK2 kit comes without a filament guide - this is a problem when using stiffer filaments on small spools. The filament tend to unwind and get stuck when printing. My filament guide is a two part solution, a base with a new ClipOn design to lock the guide to the Prusa frame and an interchangeable filament guide (loop). 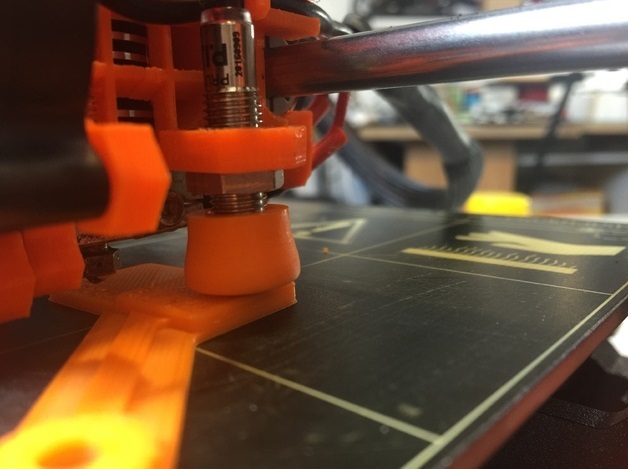 Filament guide for Prusa i3 MK2. 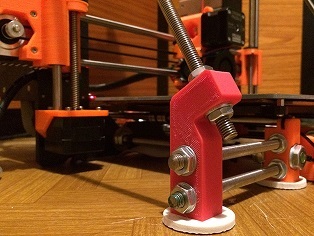 Clearance for max Z axis extruder position. Snap-on filament filter for your Original Prusa i3 MK2. 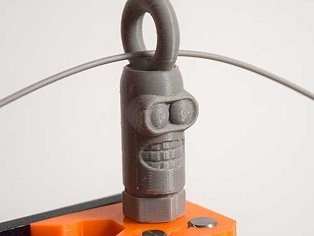 Just add some foam and poke your filament through it. It will wipe away all the dust which sticks to your filaments. A "Bender" head filament guide for side feeding filament on an Original Prusa MK2, it fits a specific hexagon hole on the top of the Z Axis top bracket. This will probably not work for any other printer (unless you are lucky enough to have a hexagon sized just right). 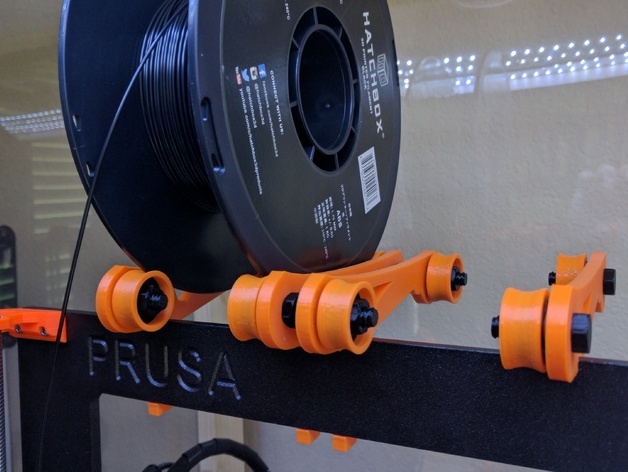 These two small widgets allow you to add a filament tube to the original Prusa i3 MK2. Take care not to make the tube too long. Otherwise, it can snag on the right side of the gantry. Dual LED mount that works with the Multi Color upgrad option. Plug into DC plug on the 3D Printer and attach lights with zip ties. Lights purchased from: Ebay, 0.5m 12V 36leds SMD 5630 LED Bar. 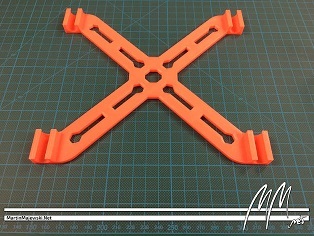 This is my second version of adaptable LED ramp holder for Prusa i3. Any type using 6 mm frame should be able to use it. 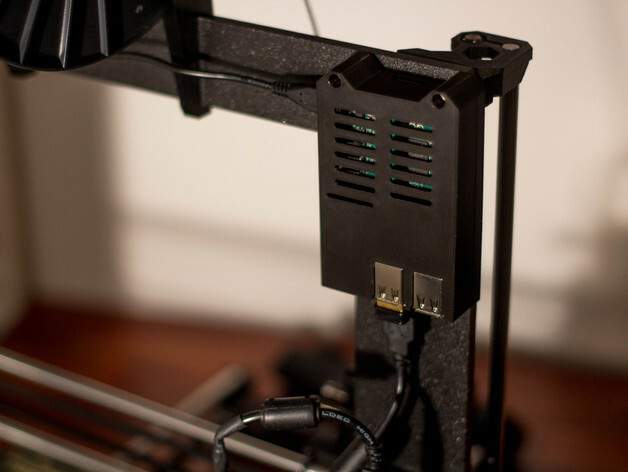 In addition, adaptors can be used to hold specific LED bar dimension and number. I provide an adaptor for Ikea DIODER LEDS. The adaptor have just to be clipped in the arm. Insert the small plug in the second arm at 90° and turn it to block the adaptor with the small grip. I provide in addition a template adaptor that can be used to easily tweak your own LED support. 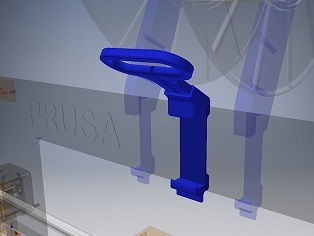 LED light holder for Prusa I3 MK2. The opening is 19x19mm and I used an LED rail like this from ebay. 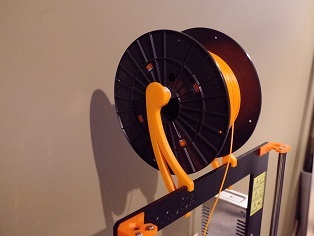 The original filament holder can still be mounted and dismounted while the light is in place. 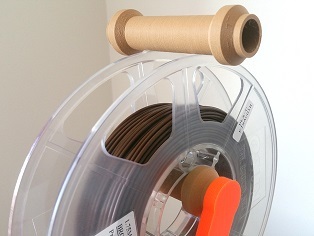 This is a spool holder that allows you to quickly remove and place a new spook on the printer for printing. I am not a fan of having rods or tubes and I wanted something low profile. They latch onto the frame the same way that the original Prusa i3 Spool Holder does with just about the same clearances. Not only that it looks not as well engineered as the other parts of the machine, it is also not very convenient in terms of usage. Especially if you want to do layer based color printing you have to switch the filament quite often during one print. 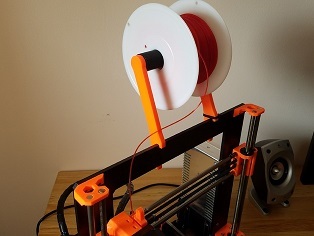 Bending the original spool holder to release the mounted spool, as well as adjusting it to hold the new one in place (especially if the spools width differs from the first one) is time consuming and tedious. 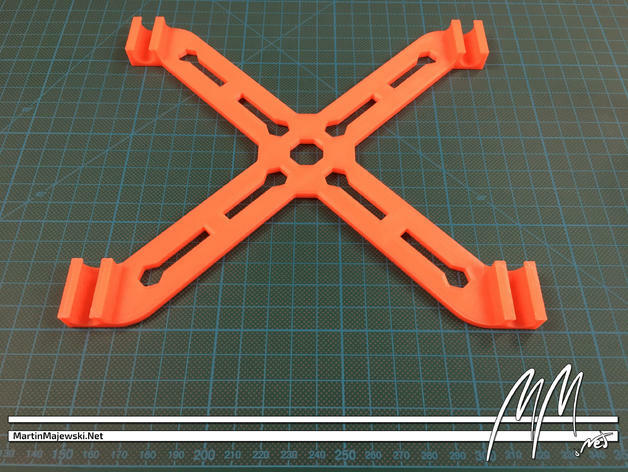 A new design for the spool holder of the ORIGINAL PRUSA I3 MK2 3D PRINTER. 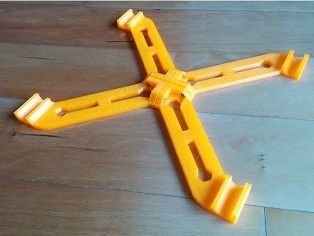 It consist of 4 printed parts and one smal piece of pvc pipe. The PVC tube has a diameter of 20 mm and is 10cm long. The clearance between the PVC pipe and caps may be too large or too small. This is due to the fluctuating iner diameter of various manufacturers of PVC pipes. But some 2 part epoxy can fix that. This was my first design, a very simple shaft I made to go with the Prusa I3 MK2's OEM spool holder. No modification needed. I will add the files in a little bit. The Mk2 uses every bit of space available for the heatbed which proved a bit difficult for adding the cable chain with proper clearance. 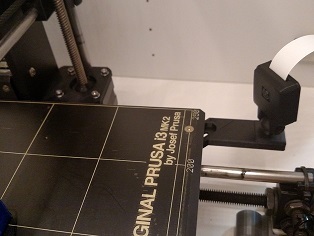 To make up for this, I added a couple of additional parts to allow the part connecting to the x carriage rotate about the z axis. This is my custom made case for the Raspberry Pi computers for those that want to run a 3D print server like OctoPrint. 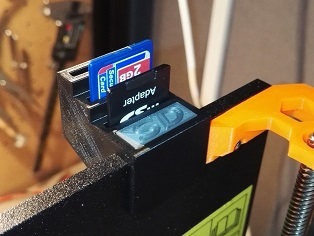 SD card holder for Prusa I3 mk2, for fitting to the frame. 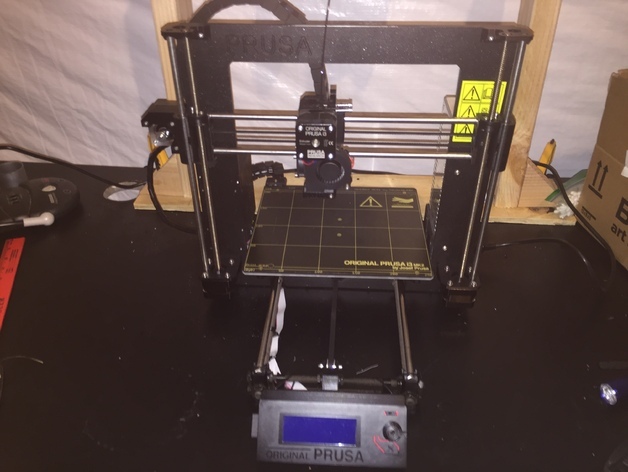 Raspberry Pi Camera mount and case designed to fit an Original Prusa MK2. 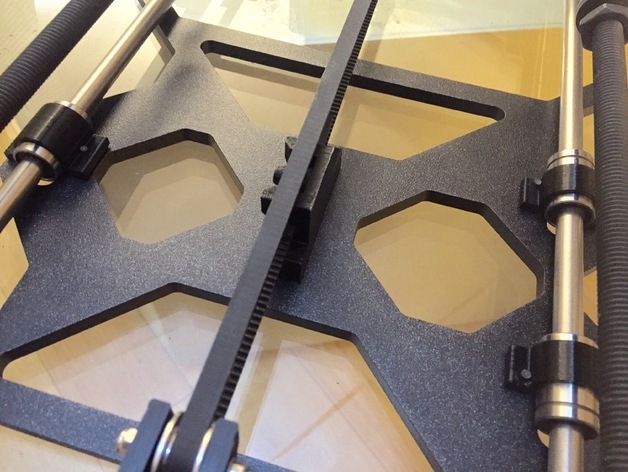 1-M3x10 screw will be needed to replace the stock M3x8 screw that attaches the bed to the frame. Slight modification of the mini version of thing:1707045. I removed material from the 18mm outer part so it better matches the shape of the nut and washer. 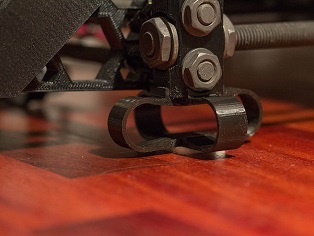 This allows the printer to sit flat on the dampener without the use of the felt feet from the i3 kit. I also modified the mating notches for ease of assembly. 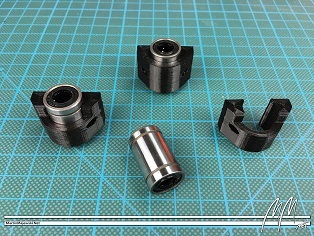 The inner 22mm part is unchanged. 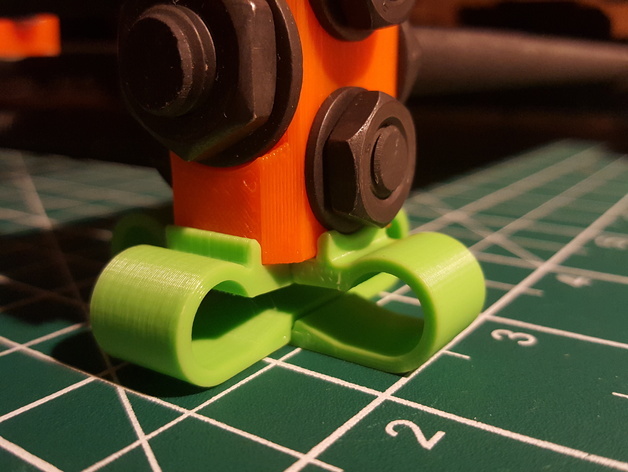 This is my take on lazzymonk's vibration dampers, dimensioned to fit under a Prusa i3. 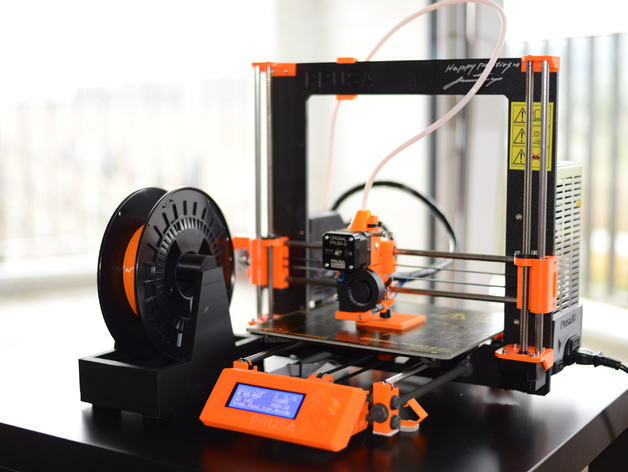 Having recently purchased an Original Prusa i3 MK2, I was dissatisfied with the poor bearing mounting method that can easily introduce variability in the Y and Z axes. Inspired by other overly-complicated solutions to the problem, I designed these easily-printed straps that when used with 6x M3x10mm machine screws, replace the zip-ties on the MK2 without any other changes and fully capture the bearings from movement. Assembling the Prusa i3 MK2's y-frame can be a tedious and frustrating experience in terms of aligning it perfectly square. This "little" helper does not relief you from this burden, but it can (and hopefully will) ease this task a little bit. Slide the 10 mm rods into the brackets of this square and it will hold them perfectly parallel for you. Furthermore it gives you a rough estimation of how deep you have to screw the front nuts of the metal X-Z-frame mounting onto the rods, but yet gives you enough room to adjust the nuts later on. The Prusa i3 MK2 - Y-Frame Assembly Helper by MartinMajewski is great, but what do you do if your current printer is not big enough to print it? I cut it in to four pieces and added flanges with holes to suit M3 machine screws to allow the pieces to be joined back together. Each piece will comfortably fit on the bed of a Monoprice MP Select Mini (120mm square). I add to my effort to make the linear system of the Prusa i3 MK2 more stable, reliable and easier to adjust these clips for the ordinary LM8UU ball bearings, that come with the machine. 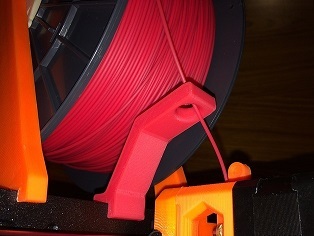 As with Thing 1837936 (http://www.thingiverse.com/thing:1837936) you don't need the flimsy zip ties any longer. Instead you can mount your bearings "pre aligned" to the Y-carriage by using two M3 screw per bearing. Copyright © 2019 - Derrick Hampson.